Weighing systems include aggregate weighing system, cement weighing system, water weighing system, additive weighing system (optional). Load cell ensures their weighing accuracy. 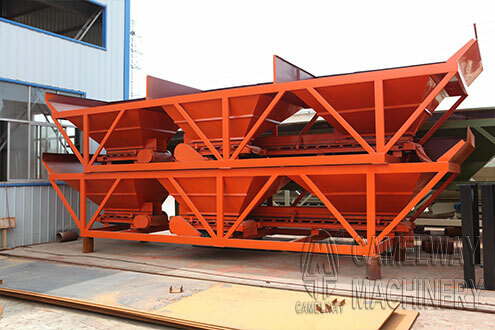 Aggregate weighing system is realized by aggregate batching machine. In small concrete batching plant, because there is less volume aggregate for weighing, we usually equip accumulative weighing, scaling every aggregate one by one. On the contrary, in bigger concrete batching plant, we usually equip independent weighing, scaling every aggregate separately at the same time, high efficiency. See aggregate batching system for details. Cement, water, additive are usually weighed in a container, the additive can be fed into water weighing container first, the additive and the water will mix quickly and homogeneously , then discharge together into the concrete mixer. In addition, additive weighing system is optional. Additive is used to make concrete with certain characteristic, customers can choose it or not according to their actual requirements. This entry was posted in Solution and tagged Material weighing system by camelway. Bookmark the permalink.